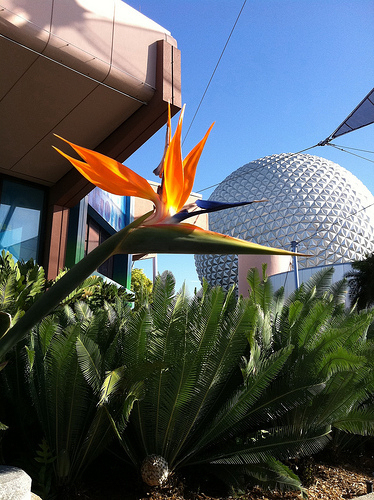 Today was a visit to Epcot. Our original planner actually had us visiting here over two days – one in Future World and then another day at World Showcase. However, we decided to see if we could manage it in one day! So, the plan of attack was to get there for rope drop, Steve to dash for a FastPass(FP) for Soarin’, then go and do Test Track, do everything else in Future World before heading over to World Showcase to look at each country and our ADR at Teppan Edo in the Japan Pavilion…so that was the plan…this is what actually happened! We got to Epcot at about 8:30 and parked up. It was a short walk to the entrance and we then picked a queue to stand in. We also spied Daisy Duck and queued up to visit her for an autograph and photograph. Steve had wandered off with our photopass card, so I was given another one and was told we could merge them. All good. Liam and I walked through and started to queue to see Mickey and Friends in the Epcot Character Spot. I dropped a quick text to Steve to let him know where we were as we had originally said we’d meet at the water fountain in the middle of the park. Steve then showed up and joined us in the queue, with the Soarin’ Fastpasses safely in our Disney lanyard…not before of course, me having to take a photo of them! Oh, and I love Donald’s feet! Our Soarin’ Fastpass return was between 10:30 and 11:30, so we headed to Test Track first to ride that. Arriving at Test Track, the queue time said 20 minutes, the CM said 45 minutes and was encouraging single riders. Luckily the queue area is interesting, with lots of things to look at, as well as being air conditioned. Finally, we got to the ride and after a short video intro in a holding area that tells you what ‘tests’ we would be doing, we were buckled into our test car. With three people per row and six people per car, there was enough room for me, and Steve noticed people bigger than me who were riding as well, so don’t worry about fitting in this one. There are generous, normal car seat belts – the middle seat has a lap belt only. I think if you were plus size and tall though it might be a bit of a squeeze as there wasn’t much legroom – especially in the back. Really, really great ride. I go much faster than 60MPH on the motorway, yet this seemed so fast! We grabbed a FP on our way out as our Soarin’ ones were now active, enabling us to get another one. Into the big building that is The Land to go onto Soarin’. High expectations here for this one. Eventually after walking forever(!) we got to the ride and were put into rows and waited to board. After a safety film from Joe Swanson (tee hee) we were led into a room with rows of seats. Lap type seat belts, with between the leg loops, I presume for smaller kids. From a plus size perspective, seats were fine, and the seat belt too. We rose up and we were soarin’ (see what I did there?) over seas and mountains – not only sights and sounds but also smells. Impressive, but I wouldn’t say “OMG, that’s so amazin'” It was a cool simulator, and Liam loved it, but for Steve and I, it just didn’t live up to the hype. The adventure on the screen didn’t seem to flow well, and you jumped from scene to scene quite choppily (is that even a word?!). That said, I did lift my legs as we went over the trees and ducked from the flying golf ball lol. For simulator type rides we all preferred Star Tours and The Simpsons Ride. I don’t think I would queue up for 2 hours for Soarin’ …sorry! All a bit peckish, and not having had breakfast, we went through the stations of Sunshine Seasons to grab a bite. Hunger dealt with, we went onto the boat voyage, ‘Living with the Land’ which started off a bit meh, but as you went through the green house, it suddenly became very interesting – for me at least as a ‘grow your own’ person. I just loved seeing all the things that they were growing, and things that I probably would never see in real life, like dragon fruit and pineapple! I was quite in awe of it all to be honest and I think next time I would do the ‘Behind the Seeds’ Tour to take a closer look. Onto the Circle of Life next – a short environmental film narrated by Simba, Timone and Pumba from the Lion King. Steve commented that it had some very powerful imagery and I have to agree. With a line drawn through that section of the park, we made our way back to Test Track for our FP run. En route we spied Chip ‘n’ Dale and a short, but hot and zero shade line (a recurring theme!) before we got to the front of the queue. They took a break before we could meet them (this always seemed to happen to us!) These guys were great fun, pinching our spray fan and Liam’s cap and ninja fighting with each other. I think the break did them good as they were a lot more interactive with us than the few people that were in front of us. After lots of hugs and kisses we took photos and got autographs. A lovely lasting memory of a character meet and greet! So, as I said, we made our way back to Test Track, this time riding in the back seat. Great ride! Ellen’s Energy Adventure was next, which, whilst sounds long at 45 minutes (8 minutes is a pre-show) it is entertaining, and a cool place to rest your legs for close to an hour! Into Spaceship Earth next, (giant golf ball :P) which was another good and informative (if a little dated) ride. Learning, whilst at a theme park, is diamond bullet in the forehead genius! Liam particularly enjoyed this one, and it was pretty funny at the end when they used our photos in a film. …before we headed over to Club Cool to sample the Beverley! This drink is the oddest thing I’ve ever had the misfortune to drink haha. I knew about it before we went and filmed Steve drinking it. He didn’t have a major gross out with it, but said he understood why everything says it’s nasty! He said it starts of tasting okay and then becomes really bitter. For me it was yuck lol. I quite liked the Japanese drink , and thought the little Coca-Cola paper cups were cute lol. Into the Seas with Nemo and Friends and into our clam mobile. Not as interesting as the Land ride, but I love Nemo so enjoyed it. I thought it was clever they way they projected the characters into the tanks with real fish. The queue area though is L-O-N-G! I can’t even imagine it ever being so busy to fill the whole line! Turtle Talk with Crush was next and was totally awesome dude! Very clever – really enjoyed this. With nearly everything crossed off in Future World, the last thing to see was Captain EO. We had done this in Disneyland Paris and was looking forward to watching it again. It didn’t disappoint this MJ fan, but I don’t remember the seats moving in Paris? With our ADR slowly creeping up on us, we moved into World Showcase with the intention to visit Canada, UK, France and Morocco before going into Japan and Teppan Edo, then finishing off by going to USA, Italy, Germany, China, Norway and Mexico, before going back to Canada/UK to view Illuminations: Reflections of Earth…phew!! It’s amazing how quickly time flies and to be honest, I don’t remember venturing much into each area other than a superficial look – I think I thought we would go and see everything properly after our ADR. Now, despite cancelling a lot of our ADRs due to us feeling that they were over-priced, I was looking forward to this one for the chef preparing and cooking the dishes in front of you on the hotplate. I guess you go to America with this notion that the portions are going to be humungous, and I’ve had more noodles in my chow mein from the local Chinese! Anyway, regardless of that, the steak was delicious and the portion, whilst smaller than I was expecting, was plenty, especially since we also had a starter. So to be fair, I’d have ended up leaving some of it had it been any more. Drinks were refills and I think included, or maybe not, I’ll have to check the receipt…. *checks*…no, they were extra at $2.95 each. Our total bill was $120.56, with a tip it was just over $140. Would definitely go back here, was a great experience and the food was very good. Out of the small windows the weather was looking decidedly suspect – wasn’t sure if it was the tinted windows…sadly it wasn’t, it was rain…and lots of it! We only had two ponchos as managed to rip one of them on a ride at some point. Steve said “I’ll be fine”, so Liam and I donned our smexy orange plastic ponchos and we ran over to a little Japanese candy store opposite Teppan Edo and bought a few things, tried to hang out in this tiny shop for as long as politely possible in the hope that it would stop raining, but no, it was coming down harder! Have got lots of photos from inside the shops since that is where we spent so much of our time during the rain! It’s the closest I’ll probably get to going to Japan, so it was nice that we were stuck in this part of World Showcase. So we made another dash back across to the shop underneath the restaurant until we got bored and decided to get with the “we’re British, we can handle a bit of rain” programme and walked into the American pavilion. Spying a funnel cake stand, and since we didn’t have dessert and since it was also on our ‘foods to eat in Orlando’ list we bought one to share between Steve and myself, whilst Liam wanted a deep fried ice-cream O_o. Covering our desserts, we ran from the stand to an undercover area beside a shop. We parked our bums on the floor and enjoyed our fried delicacies. Funnel cake was as I was expecting – the SLAB of ice-cream on top I was not! With the rain still beating down I insisted that Steve buy a poncho as he was potentially going to get drenched, so he bought a Disney one for $8.50. After killing some time in this gift shop, we admitted defeat, we knew we wouldn’t be seeing much of World Showcase today and decided to just walk back to Canada to try and find shelter to watch the fireworks. By now, the surfaces were flooding and we sloshed our way from pavilion to pavilion, asking CMs along the way if the fireworks would be cancelled. They said that they are rarely cancelled and then it is usually only because of a hurricane! Flashes of lightning now were appearing, so we hung out in the Canada gift shop, as were lots of other people. We ended up buying a towel to dry off with when we got back to our car, as typically, we hadn’t brought any out with us today. We also added to our fridge magnet collection, buying a couple of Epcot ones that I liked. As 9pm approached, the announcements came that the fireworks would be delayed. We decided to ride it out as we had already waited all this time in the pouring rain, so didn’t want that all to be for nothing! Delay after delay until finally they were due to start in a few moments! Yay! The rain was calming down and we took a spot to watch the display which was so worth it. We oohed and ahhed and I think I said ‘wow’ quite a few times as well! With me not wanting to take my iPhone out in the rain, we don’t have any photos of the fireworks, I took some stills from the video that Steve filmed on our waterproof camera (you can hear the rain drops!). Part one of Illuminations can be found on my YouTube channel here, part two here. The car park was pretty empty so I just pressed the fob and waited to see which car lit up lol! Got home, dried off properly and fell into bed! My thoughts on Epcot? Well, I can see why it isn’t everyone’s cup of tea. My best friend thought it was rubbish, another friend thought ‘meh’ . We, however enjoyed ourselves. It’s a theme park in which you learn things (I still think it is genius!). I think most, if not all of the attractions in Future World are indoors, so you are out of the heat for most of the day, and despite the word Epcot jokingly standing for Every Person Comes Out Tired, I have to say I disagree. Granted we didn’t get to do all of the World Showcase due to the lame weather, but we did pretty much everything else, saw some of World Showcase, and stayed right to the end for fireworks, can’t say we felt overly knackered. I am still so gutted I didn’t get to see more of the countries in World Showcase, I was SO looking forward to that, and I kick myself now for not forcing us to go back there just to do that. As I type up my trip report I realise we had a few wasted days which we could have used half a day for to pop to a theme park for a few hours. As n00bs we wanted to pace ourselves, but really, there was no need!